MailSuite quarantines emails marked as SPAM by its AntiSPAM module into the "spam" folder of your mailbox. A list of your SPAM emails quarantined by MailSuite is sent to your address at everyday 4:00 and 16:00. A URL included in the list enables you to recover the emails you want to read or to edit your white lists. The list is NOT sent if any emails of the user are NOT quarantined. Your quarantined emails are held in SPAMBlock within 60 days and deleted at 1:00 of the day after 60 days. 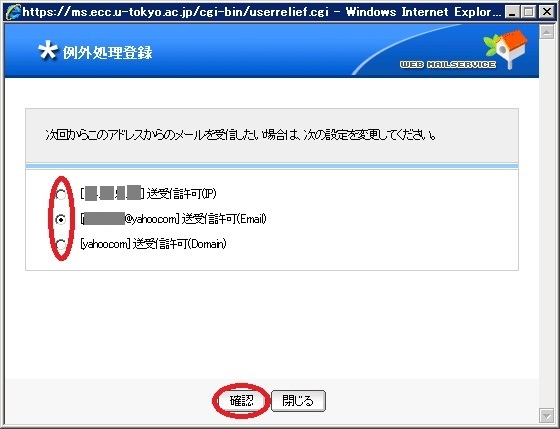 For ECCS users: the sender of the list is "ecc-support [at] ecc.u-tokyo.ac.jp". For MailHosting D users: the sender of the list is "admin@your.domain.name". The administrator of your domain may change the sender address. Your quarantined emails are stored in your "SPAM" folder. Whenever you log in to Web Mail, you can see all the emails in that folder. A list of quarantined emails, of which subject is "Spam List [YYYY/MM/DD]", includes both a one-time URL and a summary of the emails as follows. Open the URL in your browser to see the quarantined emails. If you find a non-SPAM email is quarantined, you can click the button labeled "救済" to recover the email or click the button labeled "許可" to edit your white lists. "Recover" makes the email delivered to your mailbox for this once. "White lists" remember the rules of emails to be never quarantined. Click the button labeled "救済" to open the dialogue as follows. 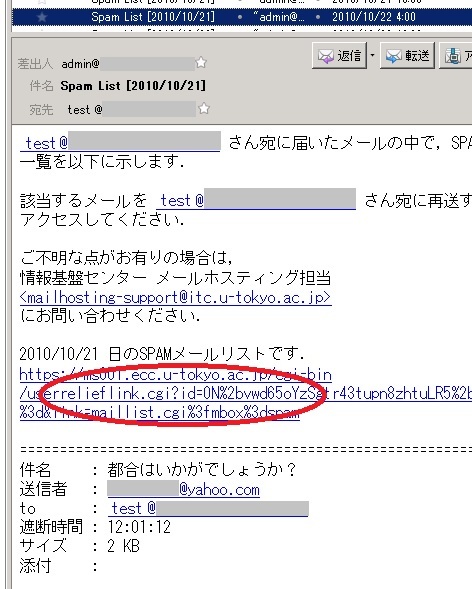 Click "OK" button to recover the email or the button labeled "キャンセル" to cancel this action. Click the button labeled "許可" to open the dialogue as follows. The first of three radio buttons means "add the IP address to your white list". The second is "add the sender address to your white list". The third is "add the domain to your white list". Choose one of them and click the button labeled "確認" to add the choice to your white list, or click the button labeled "閉じる" to cancel this action. IP address based white list accepts any emails sent from the IP address. The quarantined email was sent from the IP address shown in the dialogue. Email address based white list accepts any emails just with the sender email address. Domain based white list accepts any emails with any sender addresses of the domain.